During the school break, the kids and I hit Mass MOCA in North Adams, Massachusetts, to see Color Forms II: The Basic Utensils. This is a show of works by the artists Soyeon Cho and Lisa Hoke. Both artists work with common disposable or recyclable items. 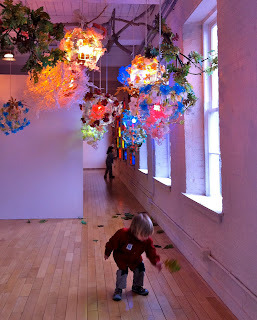 Even as one approaches "kidspace," where the show is mounted, there are brilliant assemblages covering the walls like moss. Inside one encounters delicate, illuminated bird cage-like constructions that seem to be covered with butterflies and to drop leaves. Further in, the windows glow in all the colors of the rainbow and another beautiful assemblage seems to have grow along the wall. Hoke creates patterns from the colors in the graphic design on the packages. When you look more closely at the windows, you see that the "stained glass" is actually natural light streaming through hundreds of rolls of colored paper tucked in a wire frame. Trying to keep my two year old from pushing each piece of paper into the frame was a task accomplished only by the diversion of the fantastic craft area where everyone (adults too - or at least this adult) could create a work of art using recycled materials. Hoke takes the mundane, manufactured material of everyday life and creates these very organic pieces that are strikingly beautiful to boot. Its an interesting and slightly mind-bending lesson for the kids once they lean in and recognize the plastic plates and pieces of this and that. A good lesson for everyone. MassMOCA is about 3 hours from NYC and very much worth the trip. Color Forms II: The Basic Utensils runs until Sept 5, 2011.